(2) Quantity :- 450 g.
(3) Direction For Use :- Dose depends on digestive capacity. In general 10gm pak with fresh milk in morning on empty stomach. Also can be taken 10g. pak in evening with fresh milk. Lunch or Dinner should be taken after 4 to 6 hrs. OR as directed by physician. (4) Benefits :- Lord shiva and Lord brahma enumerated the benefits of this pak infront of parvatidevi and rushi Narad respectively. 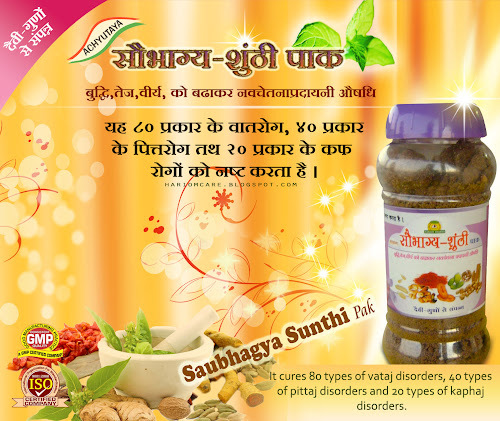 It cures 80 types of vataj disorders, 40 types of pittaj disorders and 20 types of kaphaj disorders. (5)Main Ingredients :- Saffaron(Keshar), Shilajit, Loha bhasma, Zinziber officinale(sunthi), cow’s ghee, cow’s milk, Bacopa monieri(brahmi),Asparagus racemosus(shatavari) etc. क्या हल्दी के इन गुणों से आप अवगत हैं? दूध बंद करने के लिए..